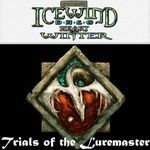 Trials of the Luremaster is a free downloadable expansion for Heart of Winter (itself an expansion for Icewind Dale I). It adds a major new quest to the game, new areas to explore, new items, traps and monsters. The quest is intended for characters of at least 11th level. This add-on also includes the last game patch (version 1.42), containing several bug fixes to the game engine.